Our dear Hoss Zaré! We’ll miss you. Photo via Facebook. Well folks, it’s the end of an era of Hosspitality and Hossy Hugs: our dear Hoss Zaré is heading back to his native Iran and starting a new chapter in his life back home. He has been such a big part of our local culinary scene for years. He started as a dishwasher at The Fly Trap back in 1988, which he later bought and took over. Read this heartfelt piece about him from a couple of years ago by Tamara Palmer, and here is my review of Zaré at Fly Trap from back in 2009. He’s had some really rough times (his parents were tragically and horrifically murdered in Iran, and he suffered a heart attack back in 2010, scaring us all! ), but he has always kept his big heart open and full of love. He included this in a farewell piece he sent to me: “I spent three decades of my life waking up to dazzling sunshines, soothing breezes, and calming sea waves of San Francisco filled with love of the sun, delight of the beach, and generosity of the ocean overpowered by warmheartedness and thoughtfulness of its people. You supported me during my days of gloom and glory, success and failure, and health and hurt. In return to all your kindness and hospitality, I brought you the sweetness of Baklava, colorfulness of Koofteh, and richness of the bone marrow, and my genuine Hosspitality!” Indeed. You have a chance to visit Hoss at his final appearance this Saturday February 10th at a demo at the CUESA Ferry Plaza Farmers Market (at 12pm). It’s the day before he leaves town, so don’t miss one last Hossy Hug. Best wishes and much happiness to you, Hoss. Thank you for all the kindness and warmth and heartfelt meals all these years. Another one of my favorite longtime chefs, Sean Thomas, who held it down at Blue Plate for seven-plus years and then consulted on the opening menu at City Counter in the Financial District, is now the executive chef at ~CITY COUNTER~. 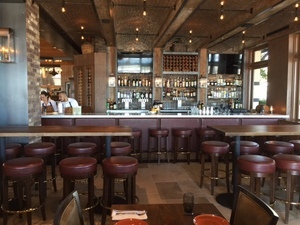 He has added a County Line chicory Caesar salad (with pomegranate, bacon, and his famous pecorino dressing), and he’s working on a new happy hour menu—come by Mon-Fri 4pm-7pm for it (they have also added Lo-Fi Cocktails to the menu). Open Mon-Fri 11am-7pm. 115 Sansome St. at Bush, 415-844-0633. Something’s fishy at Amami. Yelp photo by Melanie T.
King cake beignets, available now until Mardi Gras at Brenda’s French Soul Food. Instagram photo by @brendasfrenchsf. You like cute waffle sandwiches in the shape of a Japanese fish? Of course you do. 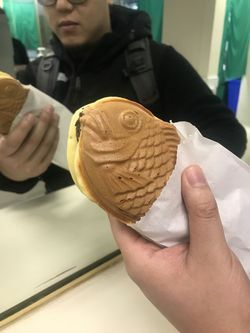 There’s a new taiyaki place that has opened in Union Square, ~AMAMI~, offering a variety of fillings (like red azuki bean and white mochi, or matcha cream with black sesame mochi—get one freshly made), plus green tea matcha soft-serve ice cream on the side, hot or cold tea lattes, and more. 430 Geary Blvd. at Mason. This Saturday may be ~ONE MARKET~’s big 25th anniversary dinner, but this Friday February 9th, you can enjoy half off the entire menu all day and night, including all beverages! It’s a wonderful way to say “thank you” to their customers. Reservations are strongly suggested but there will also be some tables open for walk-ins. 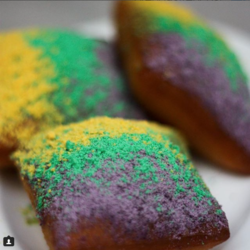 Just in case you are plotting your plans for Mardi Gras (which is next Tuesday February 13th), here are a few ideas for you: of course ~BRENDA’S FRENCH SOUL FOOD~ will be serving up beignets for brunch (and is offering king cake beignets until then! 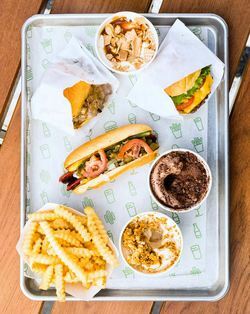 ), ~JUST FOR YOU~ in Dogpatch will be serving their traditional N’awlins fare, and you can snag some po’boys at ~QUEEN’S LOUISIANA PO’BOYS~ (they have their new location at Pier 33). And there’s the newish ~BAYOU~ in the Mission too. ~TOWN HALL~ always throws a helluva party, and ~THE ELITE CAFE~ is hosting a party too, with unlimited crawfish. SF Beer Week plus Mardi Gras equals a party on the patio at ~4505 BURGERS AND BBQ~ with special beer releases from Harmonic Brewing, po’boys, gumbo, and king cake. ~ALBA RAY’S~ will have live music in addition to a special Mardi Gras menu (including andouille corn dogs, jambalaya cones, po’boy sliders, and beignets with a king cake twist). Frozen Irish coffee slushies will keep you going. Laissez le bon temps rouler! And if you want something with less beads and Hurricanes but still some Louisiana soul, ~SERPENTINE~ is kicking off its new once-a-month Sunday Supper Series beginning Sunday February 11th and will celebrate the flavors of Louisiana served family style for just $40 per person (tip not included, tickets here). 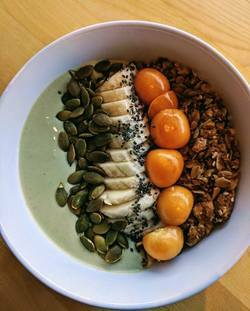 House-blended matcha and nonfat Greek yogurt with golden berries, chia seeds, and pumpkin seeds at Zazzi Foods. Photo via Facebook. 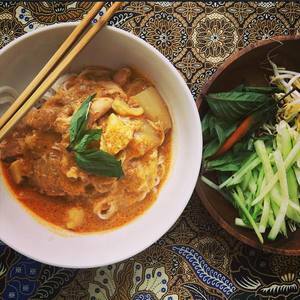 East Bay friends, get ready to start your engines (or top up your BART card) to head to Fruitvale for the opening of ~NYUM BAI~ from Nite Yun in the former Half Orange space. I’ll have more on this Cambodian street food outpost in a couple of weeks—it’s due to open on Saturday February 17th. Nite’s beautiful cooking bewitched many of us during her pop-ups in San Francisco and at her stand in the Emeryville Public Market, and now she has her own brick and mortar. It will be open Wed-Mon 11am-2:30pm and 5pm-9pm. Another SF import that will be coming over to the East Bay is a second location of the Mission’s ~ELBO ROOM~. While the bar begins to count down its last year on its lease in SF, it will be opening in Jack London Square in the former Night Light (also a two-level space) as ~ELBO ROOM JACK LONDON SQUARE~. Eater caught the announcement on Facebook, and it looks like an early to mid-February opening is the current timeline. So, soon. 311 Broadway at 4th St., Oakland. That same Nosh post mentions Cassandra Chen of CC Made is in soft-opening mode of her new café, ~ZAZZI FOODS~, offering granola bowls (she owns and produces Café Fanny granola), toasts, and more, including coffee service with Tartine Coffee Manufactory. 1398 University Ave. at Acton, Berkeley. While Charlie Hallowell’s restaurant group (Pizzaiolo, Penrose, and Boot & Shoe Service) attempts to stabilize while he “steps away” for a six-month leave—with some employees choosing to leave since he isn’t—it looks like the second location of ~BOOT AND SHOE SERVICE~ that was coming to Berkeley’s Shattuck Avenue has been put on hold. The Chronicle piece also mentions there is a new chief operating officer, Donna Insalaco, who will run the restaurants for now.